Harrison, Idaho Harrison is nestled on the east shore of Lake Coeur d'Alene. 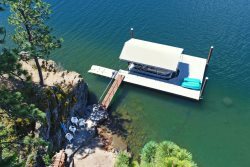 This quaint and historic resort town has long been a favorite vacation destination for families who enjoy its public docks, boat launch, shoreline campground, sandy beach and relaxed atmosphere. Harrison Idaho is just an hour drive from Coeur d'Alene along the eastern scenic shore of Lake Coeur d'Alene. This quiet, family friendly town booms into a fun and friendly resort each summer. With fun, food, boat rentals, dock camping, swimming beach and campground, this little town has everything all it a small walking friendly package. Browse the shops and stores in Harrison, Idaho or stop for ice-cream and burgers. Dinner and drinks are available as well as great access to Lake Coeur d'Alene. Harrison offers on the water camping for vacationers who love boating, shoreline campgrounds and resort living in vacation rentals from Vacation Rental Authority.